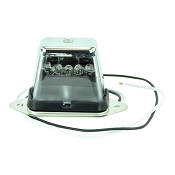 All of these LED Submersible Boat Trailer Lights mount using the standard 2 inch center. 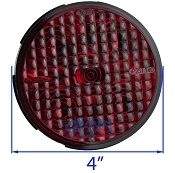 These are submersible LED Boat Trailer Lights that will adequately mount on most, if not all boat trailers. If you are mounting your trailers lights to the bottom portion of your trailer, on your pre-drilled light brackets, be sure to clean the surface where you will be making your ground connection. The most common cause of light failure is due to a bad ground. The area where your ground wire is connected to your trailer frame can become corroded or oxidized, which will impact the wires ability to ground to the frame. Be sure to clean this area before installation. 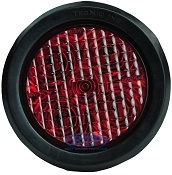 All submersible lights are just that, submersible, they are not impact proof or crash tested. 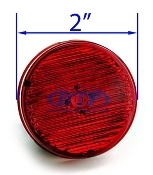 If you are having issue with your sealed lights leaking, most likely this is due to impact that resulted from backing into the water, loosening the seal. When reversing, ease into the water with your trailer, this will ensure that you do not damage your trailer lights and will greatly increase their submersible qualities. Just like anything on a boat trailer, proper maintenance and attention to your components will allow them to work longer for you. If you notice a light outage, check your connections and test your ground. In most cases a light outage is directly related to a connection or ground issue. Also, keep in mind that in most trucks and larger suv's, you actually have separate fuses for your trailer lights specifically. 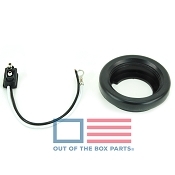 If you have tried everything and you simply can not figure out why that Right Trailer Light will not turn on, check your vehicles trailer right turn fuse to see if that may be the issue. Also remember to work from the back forward. Test the Light, test the connection, test the ground, tests the trailer plug, test the truck plug. You will find the issue with your lights if you strategically tackle your issue this way.